I wish I could tell you that I eat pies and burgers for most of my meals but unfortunately, no. But I do eat fresh salads like this one all the time! This is great for your spring body cleaning! Now, don’t get me wrong most of my recipes feature rich ingredients. Beer, butter, bacon, buttercream, all the B’s basically. Trying out new recipes is always so tempting. When I make a pie I have to try a slice.. or four. It’s a hard knock life for us foodies. Day in and day out I try to keep it on the healthy side as much as I can. On any given day I usually have some greek yogurt for breakfast, a salad for lunch and maybe some fish or chicken with roasted vegetables for dinner. I’ve recently had a liking to edamame. Beans are some of my favorite foods and edamame is like the super bean! They are soy beans packed with protein with a great taste. If you’re a vegetarian or trying to eat less meat this is a great alternative. 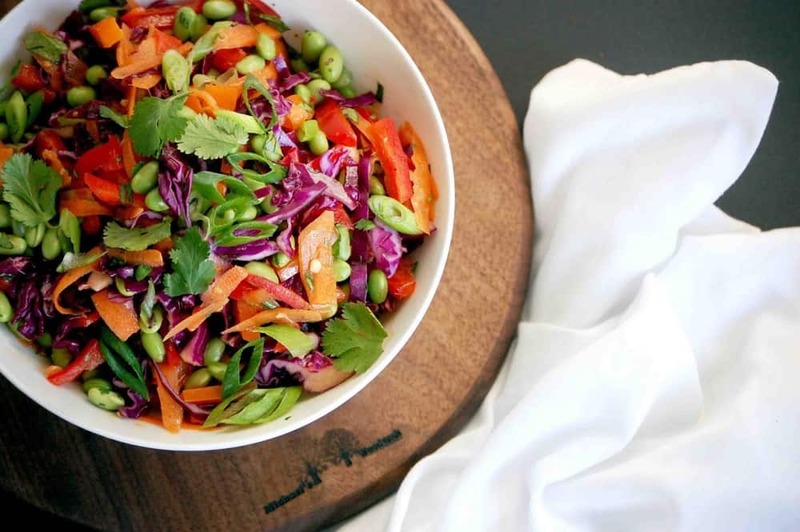 The edamame bean is the base for this chopped edamame salad. Every time spring rolls around my mind goes into bikini mode. Did anyone watch the victoria secret swimsuit special this year?! I know most of their bodies are unobtainable for the average woman. For those of us out there who are trying to be a little less jiggly for our insy weensy teeny weeny yellow polka dot bikinis, I hear you! I wanted to share a few simple things I always do that make me feel healthier and ward off the holiday pounds a little more easily! I try and drink a full glass of water every morning before breakfast to get myself feeling hydrated. Same right before I go to sleep. During the day I also try and refill my nalgene water bottle (32oz) at least four times a day. Also, the colder the water the better for your metabolism! I really could go on and on about water, just drink it I promise it’s the best thing for you! I know getting up and going to the gym or going on a run is tough. We all would rather stay at home and watch our current show on netflix. Especially during these cold winter months! But, I always feel so incredible after I get off an intense date with the stair master. Dripping in sweat and feeling amazingly exhausted. Now, i’m not a doctor or a fitness expert but from my own experience I sleep better at night and feel better all day when I’ve gotten a good sweat in. There may still be snow on the ground but spring is knocking at the door. Which means everything could use a good clean. I love the feeling when my apartment is crisp clean and smelling good. Break out the lysol, windex, and make Mr. Clean proud. You’ll love the feeling when you sit down for the evening and everything is sparkling. Also, cleaning is a great workout if you don’t feel like getting to the gym and it’s productive! Two birds, one stone. Ah, yes a night with my bathtub. After a long at home spa night I feel incredible! If you ever find yourself feeling off or not your best self, put everything down and draw yourself a steamy lavender bath. I mean it! Put your cell phone in your underwear drawer and give yourself some me time. Put on some mumford and sons, light your soothing candles and pour yourself a glass of chardonnay. I usually will make an at home face mask, hair mask or do a DIY home facial (cleanse, steam, exfoliate, moisturize). Afterwards moisturize yourself from head to tow and put on a big fluffy warm robe and soft socks fresh from the dryer. The heat from the robe will seal in your moisturizer leaving your skin silky smooth! For all of you who have been thinking “I really need to start eating healthier and getting back on track” this is me, telling you, right now, just do it! Chopped salads have relatively similar sliced veggies. 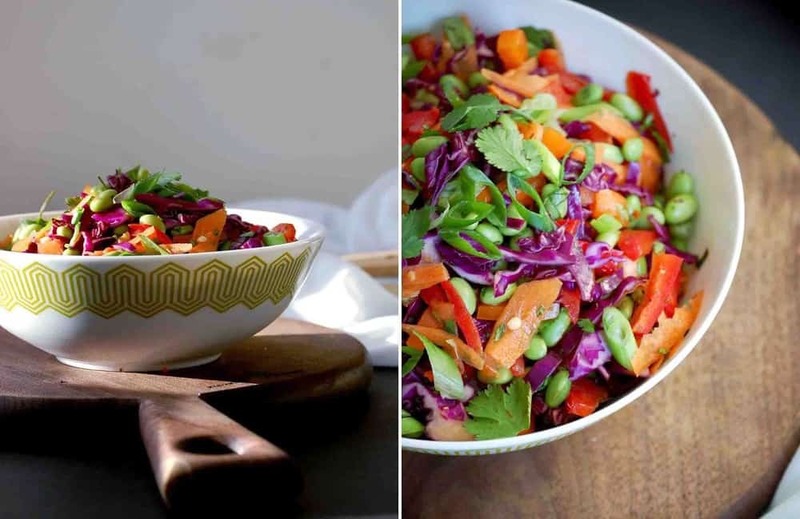 Thinly slice your veggies and put them into a large mixing bowl with your edamame beans and cilantro. Reserve your green onions Mix together. 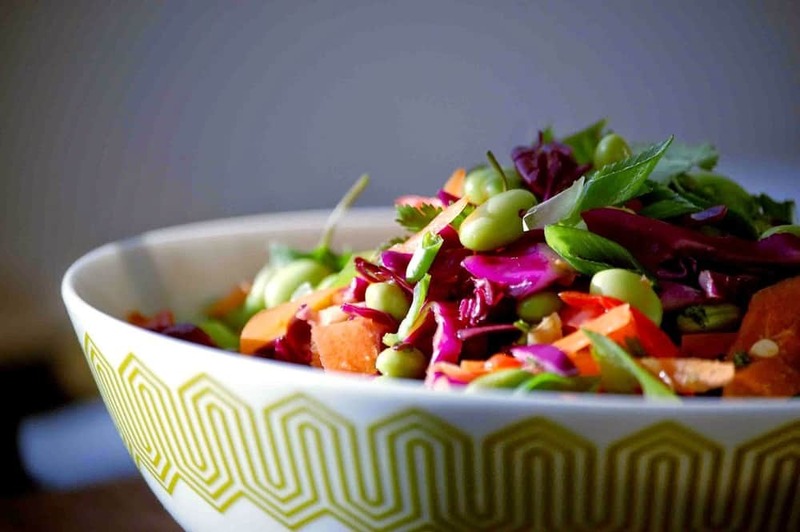 In a small bowl combine all of your ingredients for the ginger lime dressing. Pulse them together in a blender until combined or hand whisk until blended. If you are serving the salad all at once pour all the dressing in and mix together. Top with green onions. If you plan on eating the salad in small portions reserve your dressing and put on right before serving. This salad goes great with brown rice, quinoa, and grilled chicken.